These fruit butters taste great on toast—or eaten straight from the jar. Fruit butter isn't really like butter: it's more like the love child of jam and apple sauce. Yummy, right? Just wait—this fruity trio gets better. Made the old-fashioned way, each spread is crafted using farm-fresh ingredients cooked in a large kettle 'til they're smooth and delicious. 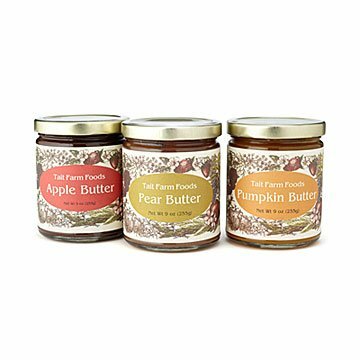 While the apple butter's made from only apples and cider, the pumpkin and pear varieties contain hints of fresh lemon, orange, and spices, plus a wee bit of organic cane sugar. Packaged together in a pretty box, each is equally transcendent on a slice of toast, or even eaten straight, with a spoon. (That's how this copywriter dug in, anyway.) Handmade in Pennsylvania. Only know they really like it. Highly recommended!! We live in the are these are made. All their products are high quality. Never disappointed. Delicious! !